On the night of our sail-away from Lisbon on Regent Seven Seas Mariner, my husband and I joined a small group of fellow passengers in an intimate lounge for a “first-timers-to-the-line” orientation. Regent cruise consultant, Brian O’Brien, hosted the get-together over cocktails and led off with a weather forecast, of sorts. “If you are running into foul weather on a Mediterranean cruise, it means the Captain has taken a wrong turn,” said O’Brien. Everyone chuckled but his comment was spot-on. During peak season—which runs from May through August—cruisers can usually count on near-perfect weather. Each time we’ve sailed the Med, sunshine has been abundant, temperatures hovered around the 70s and 80s, and cool sea breezes made it appealing to relax on the deck. Besides sunny skies and slim chances of stormy seas, Mediterranean cruises are popular because of their rich, port-intensive itineraries. On our 10-day Celestial Sojourn itinerary on Mariner, we visited five countries (Portugal, Spain, France, Monaco, and Italy) and different ports each day without having to find and book accommodations, pack and unpack, or worry how we would get from one place to another. Each new destination offered a panoply of foods, people and cultures. Our ship docked at fabled ports like Ibiza, Saint-Tropez, and Monte Carlo. At some stops, we took advantage of pre-arranged city walking tours or more off the beaten path day excursions arranged by the cruise line. Other times, we set out independently to wander and explore. We visited the charming White Villages of Andalusia (Pueblos Blancos), small towns (painted white) that dot the southwestern portion of Spain, in a region with the distinction of having coastlines on both the Atlantic Ocean and Mediterranean Sea. Another favorite find: Villajoyosa, a small beach town on the Mediterranean in the Spanish province of Alicante that boasts 300 days of sunshine each year. We imagined returning for a week or a summer, and even fantasized buying one of the colorful houses that face the sea. Familiar with Barcelona from previous travels, we knew what we wanted to see there. We hailed a taxi to visit Saint Pau, a UNESCO world heritage site with dazzling art nouveau architecture. One of the oldest medical institutions in Europe, the old hospital was once envisioned as a “human kingdom” for impoverished patients. After that, we carved out lunchtime on our own at a new, highly recommended tapas restaurant near La Rambla. Departing from world-class cities like Lisbon and disembarking in Civitavecchia (outside Rome), these itineraries offer Mediterranean cruisers a chance to tack on stimulating pre- and post-cruise visits either on their own or as part of a package. We explored historic Lisbon for three days before our cruise as we simultaneously adjusted to jet lag. Launched in 2001 as the first all-suite, all-balcony cruise ship, the Mariner shows no signs of aging. In fact, the luxury ship underwent a multimillion-dollar refurbishment in April 2014 that updated the suites, lounges and theater with new furniture, lighting and wall coverings. Our cabin (Suite 1022) was comfortably appointed with a walk-in closet, marble bathroom with stall shower, and spacious veranda from which we could enjoy land and sea views. We especially enjoyed the up-close views of smaller ports that Mariner was able to navigate because of its relatively modest size. Sailing on a mid-sized vessel with a maximum capacity of 700 passengers feels right-sized and relaxed. There are no crowds or lines at restaurants, or getting on or off the ship. High staff-to-guest ratios of 1-to-1.5 mean that someone is always around to help or respond to a question, or to carry your plate to the table from the breakfast buffet. Your cabin soon begins to feel like home (with the exception of the decadent twice a day cabin service by stealthy stewards whom you never see). The onboard ambiance was convivial and easy-going, too. We soon began to recognize other guests first by face and then by name. An old-fashioned come-as-you-are “block party’ with wine and hors d’oeuvres in the hallways at the beginning of the cruise offered us the chance to become fast friends with our immediate neighbors. The four primary dinner venues (a reservations-only steak house, French restaurant, Italian restaurant and the open-seating main dining room) offered flexible dining options each evening. Given the rich culinary heritage of Europe and the Mediterranean, we loved the addition of local “destination dishes” on each menu. These included foods or recipes tied to the ports we visited, like the tender dorade we enjoyed in Cadiz. 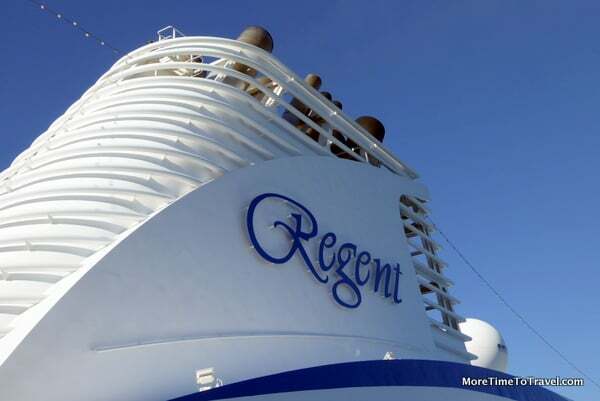 Although many luxury lines are moving in the same direction, Regent remains one of the most all-inclusive cruise lines. Fares include: round-trip air, transfers between airports and the ship, unlimited shore excursions, onboard enrichment programs, access to specialty restaurants, 24-hour room service, unlimited beverage that include many premium spirits and fine wines, some free Wi-Fi (which will become unlimited on Mariner in May 2016) and prepaid gratuities. Unless you’re a gambler or compulsive shopper hitting the casino and boutiques, the only additional charges you might incur would be for treatments at Canyon Ranch SpaClub or fees for certain bespoke “Regent Choice” shore excursions that offer special access for limited numbers of guests. It’s nice to know the estimated cost of a vacation before you leave home rather than feel like you’re being nickel-and-dimed afterwards. If we have any misgivings, it’s that we felt as if we’ve only skimmed the surface of these destinations. On the upside, Mediterranean cruises like this one leave an afterglow that lures you to return—to stay longer and dig deeper. Disclosure: Our cruise was hosted by Regent Seven Seas but any opinions expressed in this post are our own. Something to be said for sailing on a smaller ship. Eventually I’ll get to Lisbon and maybe a cruise would be the way. I’ve only done one in the Mediterranean but doing one in Europe would be so much fun! Love how there’s free Wifi and a Cayon Ranch spa. The Regent Seven Seas Mariner is large enough to offer choice and top-notch amenities but small enough to feel intimate. Loved it! You touched on the 2 things I don’t like about cruises: you barely see the destinations and lack of good wifi. But then you touched on the 2 best things: good food and no packing/unpacking! Wifi is constantly improving on cruise ships with the price declining…so there is hope! The size and all-inclusiveness of the Regent cruise really appeals to me. Even though you only get a taste of each port, you can return for a longer stay to the places you enjoyed the most. I too enjoyed the experience of small ship sailing this summer and share your thoughts about the advantages of not having to pack/unpack as well as the opportunity to sample a destination and return for a more in-depth visit at a later date. There is also less of an impact on the port and destination from a smaller ship. The Regent Seven Seas Mariner looks like a great choice. I loved reading the account of your adventures! Such a lovely ship, exciting itinerary and your food looks amazing!! It was a very memorable travel experience! The Regent Seven Seas Mariner sounds like the perfect size for a cruise in the Mediterranean! I’ve never taken a cruise, but the more I read about them the more attractive they sound. I’d get frustrated, I fear, about the short time in each port, though. Your cruise on the Regent Seven Seas Mariner sounds wonderful. The size of the ship sounds perfect. I like that that so much is included in the price and that the menu includes food tied to the ports of call. The Seven Sea Mariner sounds like a wonderful experience. I like the idea of less people and bigger accommodations on the ship. The ports of call were particularly attractive on our cruise. Looks like Regent is a cruise line to check out. Now having my first river cruise experience (which I LOVED), I can certainly see a Mediterranean cruise in my future. I like how this Regent cruise is “right-sized” — sounds perfect. And what an itinerary! Visited Lisbon for the first time this month and can’t wait to go back, even if just for a couple of days. OH my goodness! Yes please! i love the idea of the smaller ship and the list of ports were perfection. I can’t believe how comfortable your room was and not too small. Lucky you! What a wonderful cruise you had! It’s nice to have all shore excursions, tips and wines included. Regent Seven Seas has a great rep :-). I think small or medium ships are definitely the best way to take a cruise – easier to get to know staff and fellow passengers. I like the idea of visiting several Mediterranean countries at once, you really get a flavour of the area. The Regent sounds like a great cruise — I love those ports. The photo of Port of Monte Carlo was so iconic and beautiful. Yes, each time we see that view, it’s jaw-dropping!